There are many, many mornings when we are all running amok, barely getting out the door with all our clothes on, teeth brushed and lunch packed. These mornings I typically eat the leftover crust from my daughter’s toast, a couple cups of coffee and maybe the dregs of an applesauce or yoghurt. I am usually woobly and famished by 11 and the whole day feels unbalanced. And then there are mornings that start off right and I am able to recalibrate with one, simple meal: kale and eggs. I am a bit spoiled now that it is summer and my two hearty kale plants just keep kicking out hearty leaves. Woe is me come winter when it is back to the store and damp bundles. But I will stay here, in the happy place and not think too far ahead. This is a quick meal that keeps me satisfied for hours and also props up my righteous side enough to plan better meals for the day and sometimes even the week. Heat a non-stick or well-seasoned cast iron pan over medium heat. Thinly slice some onion. Add a dollop of butter or olive oil to the pan, add onions. Slice/chop several large leaves of kale and place on top of onions, lightly salting the whole pile. Cover and let steam/sizzle for a few minutes. Locate a bit of sausage if you wish (I often use the Morning Star patties but today had a couple pre-cooked chicken apple breakfast sausages), slice and add to periphery of pan. 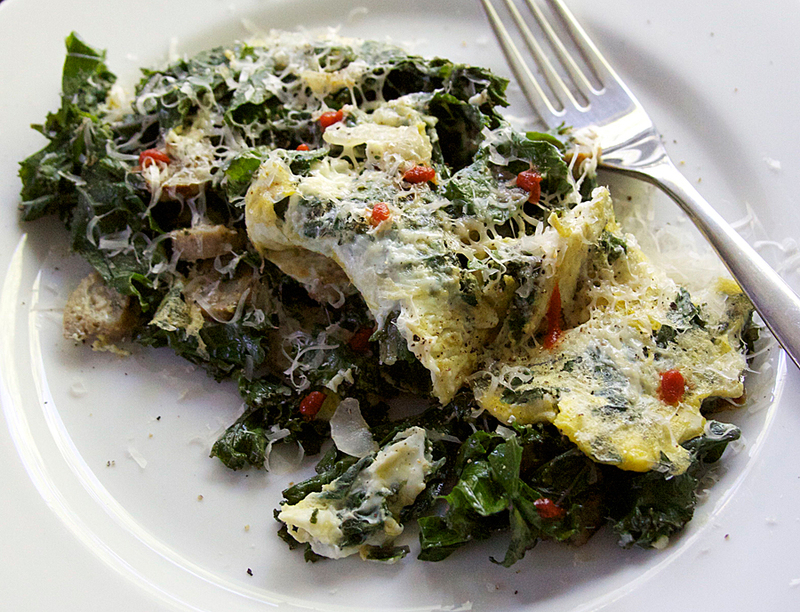 Give it all a couple stirs while the edges of the onions, kale and sausage crisp a bit. Crack in a couple eggs, break the yolks and stir around enough to bind all the bits together. Cook until the bottom is set, then flip. Once the egg is cooked through, slide it onto a plate. Top with grated parmesan or a good Dutch cheese, some pepper and some sriracha. Eat plain or with some buttered toast. This entry was posted in Breakfast, Eggs, My Favorite Things by Marina Chotzinoff. Bookmark the permalink.